Yemini asylum seekers who have arrived on Jeju Island this year will start receiving the results of their refugee status applications in two weeks’ time. Amid much public debate over how to deal with the sudden increase of refugees from the Arab state, the Jeju immigration office began reviewing applications from 486 Yemeni asylum seekers late last month. Seven immigration officers are screening between 12 and 18 applications per day, and the first results are expected in the third week of this month. The most important criteria in the screening process is whether the applicant is likely to be persecuted for political or religious reasons when they return. The ongoing civil war in Yemen will also be considered. Among the applicants are former government officials, journalists and professors. Of the eight people who were denied, two are undergoing administrative trials. 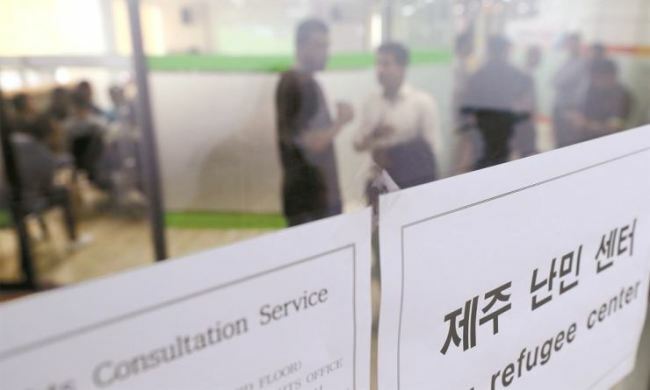 Between 1994 and 2013, 38 Yemeni nationals sought refugee status in Korea. As the conflict intensified in the Arab state, the number of asylum seekers arriving in Korea rose to 130 in 2014. The following year, 39 Yemeni asylum seekers arrived and their numbers grew to 92 in 2016, 131 in 2017, and 522 in just the first five months of this year. Until 2015, no Yemeni national had entered the country through Jeju Island. In 2016, 10 Yemeni nationals entered Korea through Jeju, which allows no-visa entry, and the number rose to 52 last year and 527 in the five months of this year. Korea enacted the Refugee Act in 2013 to accept refugees on humanitarian grounds. Since then, the number of foreigners seeking refugee status at the Jeju immigration office has increased from 1 in 2013 to 318 in 2014, 227 in 2015, 295 in 2016 and 312 in 2017.